Elise Page decided at age 22 to leave the Canadian winters behind forever and build a life in Mexico. Now a successful property manager who also has a home “practically sitting in the ocean” she shares what she knows about maintaining a house or condo in a coastal Mexican town. Anyone who has ever owned a home in a coastal area can attest to the extra care beachfront homes require. Heat, humidity and salt air have a big impact on properties within a coastal zone right down to what type of furnishings and appliances you should buy. Living in Mexico as an expat is easier than it’s ever been in many ways but contracting for different services is still different in Mexico, including securing the property management services you will need if you have a second home here. "I love Mexico! Fewer regulations!" The sense of freedom that expats love about Mexico translates into less regulation of service providers, less professional accountability and less legal remedy if something goes wrong. People can hang a shingle in many professions without any of the certifications or credentials you expect to see in the United States or Canada. You should look for service providers with excellent reputations and references you can confirm for reliability and trustworthiness. You should verify that they have been doing the service for a long time and talk to people like you who have used their services. After working in hotel property management for several years, I worked for a reputable private property manager to further establish myself and later bought the business from him. Having a long track record is important. Your property manager should be fluent in Spanish and English. You need to communicate your needs and they need to be able to communicate down the line with electricians, gardeners and housekeeping personnel you may need or want to hire. Your property manager should have a network of skilled and trustworthy Mexican plumbers, electricians and contractors. The manager should know what constitutes a fair fee for minor repairs and the drive to go to bat for you for a better deal when its called for. They need to be aware of the level of worker supervision required if a repair is being done, like painting a railing for example, and be able to check the quality of the work before paying the contractor. In the States or Canada, you might be able to leave a home vacant for months at a time. In Mexico, non-occupied properties need to be checked by someone twice a month. People notice when a house appears “abandoned,” and you have a greater risk of squatters if you don’t have a visible presence at the property. The property manager should check the property after bad weather and continually communicate with you about anything that could adversely affect your investment. Argg! Maybe the oceanfront place was just a dream! Before you start getting discouraged about having a place near or the ocean in Mexico, I need to tell you that a property manager who meets all these requirements will probably cost less than $60(U.S.) a month. You should be able secure reliable, trustworthy, on-call property managers who can do all the necessary checks every month that keep up the property’s value for between 500 and 1,500 pesos a month ($38 - $103). "I'll bring my old furniture from back home"
Some things you need to know about maintenance in a coastal town are, for one thing how corrosive salt air is. Don’t expect appliances or smaller aluminum and metal items to last more than five years. Some plastics deteriorate rapidly too. Don’t bring anything into your home made of pressed wood or pine, a magnet for termites. Woods such as teak do well. Regularly scheduled fumigation is critical. The property manager needs be there when these services are performed. I've had renters whom I asked to be there report back to me that the fumigator did the job, not just stick his head in the door, squirt a few pesticide hose a few times and move on to get more calls in in a day. "I wonder what off-season is like when I'm not there." It's not pretty. The heat in the summer and salt air in coastal areas takes their toll on fabrics. Dehumidifiers are a necessity. Ceiling fans need to be kept on and air circulating 24/7 when you are away as temperatures in a house off-season can rise to over 150 degrees. Polarizing windows is popular to prevent the combination of heat and salt air that can even warp furniture in a closed-up house. Your property manager needs to check everywhere and everything for moisture. I run my hands over plumbing and walk barefoot over carpet and tile floors to check for moisture that is invisible to the naked eye but will cause mildew, mold and other problems if not remedied. When you arrive to your second home in Mexico you want everything to work. Your property manager should regularly run the appliances, flush everything, run the taps and get dirty when necessary to check behind, above and under places for problems and pests. Property management in a coastal areas is a physically demanding job. They need to have a high tolerance for hot temperatures and a degree of physical flexibility. The right breakers need to turned off and on. No foodstuffs of any kind, even dry goods, can be left behind. If you leave something in a freezer and the electricity goes off and the food de-thaws, then goes back on and re-freezes the food, you probably will never know. Yuck. If food is left to decay long enough, you will have to dispose of the entire refrigerator. There is no such thing as non-perishable food in a coastal area. What happens to a box of juice at 150 degrees for weeks at a time? You don’t want to know. If the wrong breakers are left on, you run the risk of debilitating power surge or the other kind of big shock when you receive your next electric bill. Your property manager should be able to read, understand, monitor and pay the electric bill along with the other services provided. House filters need to be checked several times a year. If you have filtered water, filters have to be sanitized and changed at least once or twice a year. Pools have their own system of maintenance. Property managers can supervise the pool service person whose regular charge might be 150-300 pesos ($8- $15) per weekly visit. If this sounds overwhelming, I can assure you that taking these steps will be second nature to the right property manager. Maintaining your ocean view home in Mexico will cost a fraction of what you would pay for comparable services anywhere along the Atlantic or Pacific coasts of America - and a small price to pay for a piece of paradise. Next up: Mexico is always a good deal, but the recent slide of the peso makes it even better. Elise Page is a property manager in Mazatlan, Mexico and a partner with Ventanas Mexico, which helps people explore living in Mexico full or part-time. General consensus dictates renting first. 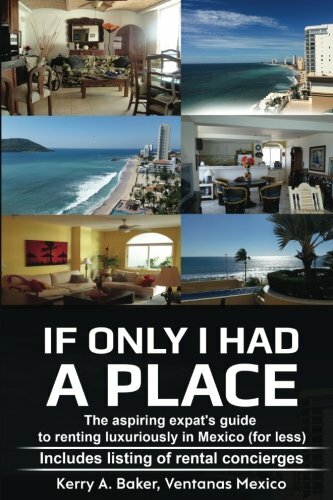 The book, "If Only I Had a Place" will tell you how to rent luxuriously for less for the years it might take to decide if Mexico would be for you in retirement.